Parks play a vital role in creating liveable cities and thriving communities. They are our most frequented spaces for recreational activities and provide opportunities for tourism, conservation and the social interaction that is vital for a connected and resilient population. Parks Week (5-13 March 2016) was a collaboration between the New Zealand Recreation Association and Parks and Leisure Australia to promote the many benefits our parks and open spaces provide. 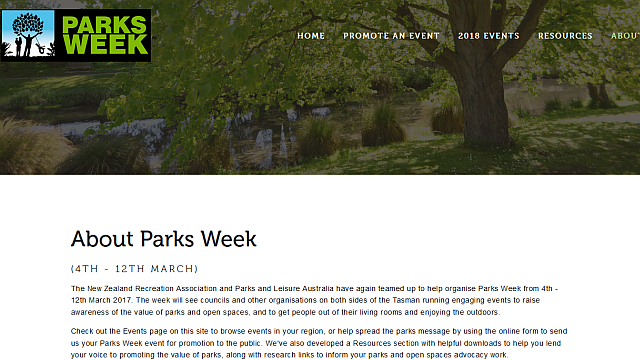 Parks Week saw councils and other organisations on both sides of the Tasman running engaging events to raise awareness on the value of parks and open spaces, and to get people out of their living rooms and enjoying the outdoors. Promote Parks week in New Zealand and Australia and encourage people to attend events in their area. Raise the profile of the New Zealand Recreation Association and Parks and Leisure Australia. Last Word worked closely with the New Zealand Recreation Association and Parks and Leisure Australia to successfully get councils and other organisations in New Zealand and Australia on board with Parks Week, resulting in more than 180 public events. These events ranged from concerts, outdoor film screenings and markets to fun walks and runs, and community conservation initiatives. They were well attended, encouraging thousands of people to venture outdoors to enjoy their local parks and learn more about the health, social, environmental and economic benefits they provide. The week was promoted in New Zealand and Australia through a wide range of channels, including media releases and pitches, e-newsletters, social media, and posters. A visit to New Zealand by award-winning UK film maker and 2016 Parks Week ambassador David Bond helped to generate media coverage about the week and the value of parks in major New Zealand newspapers, radio stations TV news shows. Across the Tasman, in Australia, ABC Gardening Australia radio host Costa Georgiadis helped to raise the profile of the week. A Parks Week website provided an overview of the week and allowed councils and other organisations to share their Parks Week events. UK film maker David Bond provided a point of interest, capturing media attention and securing TV air time for the message. Councils and many other organisations across New Zealand and Australia shared content using the #ParksWeek2016 hashtag. Wellington City Council got creative with a YouTube video parody of Blur's Park Life. The video was viewed 1,000 times. “The work of James, and his team at Last Word, assisted our organisation to exceed the strategic goals of this campaign. The website engaged the audience, and informed, assisted and motivated the participation of the multiple agencies and individuals in our target audience. James interpreted our client brief and added value with his suggestion. The Last Word team responded fluidly to the campaigns ever changing demands as it gained momentum. The work with the media and partner agencies was professional and dynamic.